Eleven months after my walk through the Cotswolds, I eased into a pleasant and familiar reminiscence of my English walkabout. Such episodes have become a regular occurrence during the past year. When it’s quiet and I’m alone, I slip back into a lantern-lit village or replay the scene of a doe and fawn bounding through a remote wheat field amidst a downpour. Generally, these episodes resolve into a feeling of contented satisfaction that can only come from accomplishing a long-held goal. This episode, however, was punctuated by an intense longing to go back; a nagging mental and emotional itch. The fantasy was immediately checked by its impracticality. The itch persisted. In an attempt to quell this impulse, I peeked at the airfare rates to the UK. To my astonishment, I found a remarkably cheap ticket (the price as already nearly tripled). Then, after the realization that the pound is at historic lows and a conversation with a giving and supportive spouse (albeit understandably jealous), a trip didn’t seem so absurd. A few days later, after a slew of emails and early morning international phone calls, I had everything in place. Time to scratch an itch. An early September walking tour alone through the North of England. The trail is called the Dales Way. The Dales Way is an 84-mile footpath that passes through two National Parks: the Yorkshire Dales National Park and the Lake District National Park. The first half of the walk follows the River Wharfe upstream to the main watershed of northern England. The second half follows several river valleys to descend to the lake town of Bowness-On-Windermere. Of course, charming little villages, complete with charming little pubs, dot the path. So far, planning is a pure joy. The pubs along the route look promising. I’ll be updating this blog daily during my walk – and hopefully, during future walks (annually if I can manage). 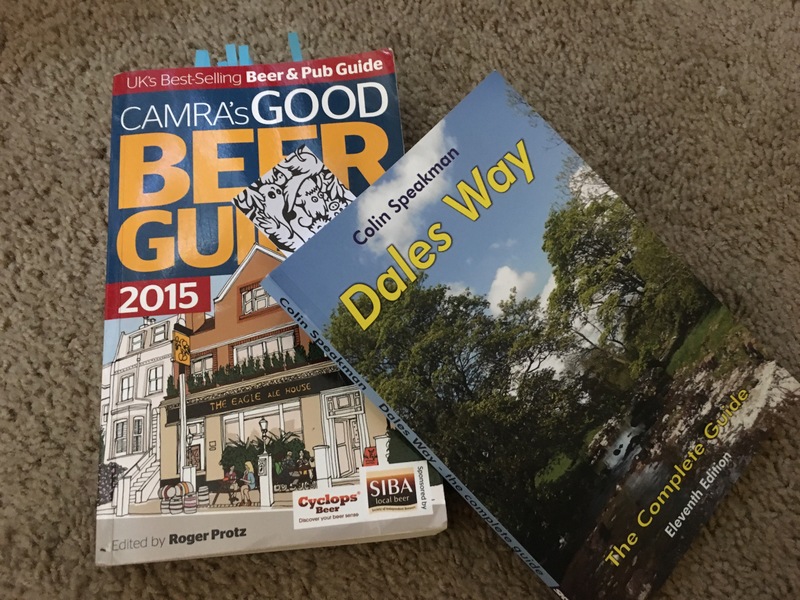 I’ve also written a few real ale and walking tour informational posts that I will publish here periodically. I will try to periscope or use facebook live posts from a pub or three if I can find a reliable wifi signal. Follow me on twitter and periscope @bucolicaholic for periscope notifications. If your September is slow, walk along with me through the riverlands. I’ll be on the lookout for Lady Stoneheart. My buddy Trevor and I have been talking about hosting a real ale party for a while. We finally decided to pull the trigger and enlisted a couple other home brewers. The result was a four pin (each pin contains 5.4 gallons of beer) party with 40-50 guests. Traditionally, cask beer is all about drinkability. With that in mind, we decided to brew relatively low abv beers. Up first, Trevor brewed a poundable raspberry wheat clocking in at 5.8%. He was shooting for under 5% but he added so much raspberry that he gained an entire percent. Next, I brewed a 3.7% pale ale inspired by the en vogue New England style IPAs. Christian brewed a traditional 5% British Strong Bitter (or ESB). And finally, Justin brewed a fabulous 5% horchata stout. One of the great aspects of real ale is its freshness. Because the beer is low alcohol, you can push grain to glass pretty quickly with very little “greenness” you’d pick up from bigger beers. The result is wholesome and fresh tasting beer that is a delight to drink. None of these beers were a month old. The nose on the raspberry wheat exploded with raspberry and the pale ale showcased ample dry hopping. Another week of age on either of these beers would have produced an inferior beer. Real ale only has a shelf life of a few days after the cask is opened for service. Whatever we didn’t drink, we would have to dump at the end of the night. We were fully ready to dump a few gallons. We didn’t think we could get through 21+ gallons of beer during a 4-hour party. 40 people and 21+ gallons, you do the math. The first pin kicked just over 2 hours in and all 4 were kicked before 4 hours was up. All the beer was gone. Victory. As usual, the local home brewers and craft fans, showed up with mountains of quality food. So much great food. One of the fun debates in the real ale world revolves around the use of a sparkler (I’ll post a summary of the debate in the next week or so). We encouraged everyone to try each beer with and without a sparkler and see if they formed a preference. The consensus was that the sparkler did indeed to change the beer. Two of the beers, the raspberry wheat and the bitter were generally agreed to be better without a sparkler and the pale and stout were better with the sparkler on. What struck me was that the preferences were almost unanimous. Another great home brew party. We will definitely throw another one of these before the year is out. Thank you to everyone who brewed, cooked, drank, and help in other ways. We have a great community here in Arizona. Cheers!